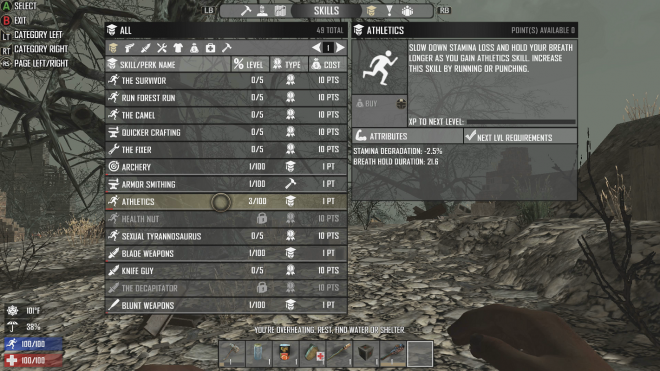 The Fun Pimps opened early access for their post-apocalyptic survival entry, '7 Days to Die,' in August 2013 for Kickstarter backers, and later in the year for everybody else. '7 Days to Die' has been brought to the consoles with Telltale in the role of publisher and with the extra multiplayer features. Survival games are very popular, and zombie games are very popular, and so it’s only natural to see zombie survival games, right? It seems like the holiest of matrimonies, but we’ve yet to see a truly amazing specimen ('State of Decay' is pretty respectable). '7 Days to Die' adds another wrinkle to this mix in the form of voxel crafting. In my first playthrough, definitely meant to be a throwaway, I spawned in a snowy forest near a dilapidated house. Two defunct cars sat on the road next to me, just waiting to be rummaged through. Starting with little to my name, I was informed that I would need to craft a stone axe. Yes of course I anticipated this; the stone axe is a fundamental tool in the repertoire of all great survivalists after all. I punched some trees, grabbed some rocks lying conveniently on the ground, and fashioned my axe. I smashed some more things and made a bow, arrows, plant fiber clothing, sleeping bag, and campfire. Then the tutorial waved goodbye and I was all on my lonesome. Well, not for long. A creepy groan rang out in the woods and I spun around, looking for the zombie who would soon receive the business end of my freshly crafted stone club. I slowly walked towards him, having toggled the sprint key to upgrade my speed from a slow crawl. Then we dueled for the better part of five minutes, me clumsily swinging the club, him doing this kind of spinning dance move. It was bad. No matter how many times I clubbed him, he just kept shuffling at me threateningly. I jumped up on a car just to break the tedium, and he climbed up after me. Then, he fell and killed himself on the pavement. Thirty strikes with a stone club doesn’t kill these guys, but a five-foot fall certainly does. Combat is probably more fun after many hours of play when homemade guns and steel-forged melee weapons become available, but almost everything up until then is mindless crafting and slow, slow movement and combat (if it could be called that). A couple of hits from a garden variety zombie is enough to kill my survivor, and they would pursue me relentlessly after spawning in my base from thin air. The voxel system is rooted in rudimentary physics for a degree of realism, but it’s also a pain. The translation to consoles and controllers was not ideal. Maneuvering through the menus is frustrating. Some items can be hotkeyed for convenience, but the rest of the interface is not convenient at all. Unlike most survival games, where the world is teeming with life just ready to die and fuel the player’s journey, the landscape in '7 Days to Die' is as dead as these shambling corpses. I saw the occasional bunny rabbit or bear (scary), but not much else of interest. After wandering around, looking for anything at all of note, I began to hope that other players would join the server and kill me just so something exciting would happen. They did join, here and there, but we never found each other in the desolate wasteland. That is perhaps the biggest difference between '7 Days to Die' and other survival games. In something like 'ARK: Survival Evolved', the most dangerous thing is the massive ball of life that is the island’s ecosystem. Raptors, giant bugs, snakes, disease, sharks, and more are everywhere and totally willing to murder every human they come across. In '7 Days to Die', scarcity is the way of life. No humans, no zombies, no animals, not much of anything at all. Perhaps I’m not giving the game a fair shake. It is very popular on Steam for a reason, I have to assume. I just can’t figure out what that reason is, even after hours of survival. I get better at things, learn more skills, build better equipment, craft a crappy house, and yet I am unfulfilled. Am I like the cursed 'Frankenstein' creature, doomed to wander alone for my entire existence, scaring away any would-be companions? Am I Cain, forced to walk the land of Nod for eternity, perpetually shunned by my peers? Sadly I am neither of these things, just a humble soul slapping together voxels with no end in sight. 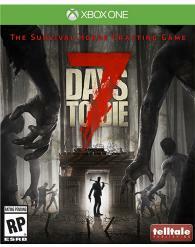 '7 Days to Die' looks rather pitiful on the Xbox One - the controls weren’t the only casualty in the porting process. The environment is bland, character models lack any kind of detail, and the textures blur together in perpetual shades of brown and gray. Take an early Xbox 360-era shooter, slice down the framerate and add a healthy amount of pathfinding and animation bugs, and you have the recipe for this game. The audio is a bit better because there’s not much of it, which arguably makes for a scarier, tenser video game. The surprising sound of a zombie in a place where I had not seen any zombies can be briefly unsettling, followed by my dread at the prospect of fighting said zombie to the death. Music is sparse. Multiplayer games are supported, but currently the population is very small and I never saw another human being. I fired up split-screen with a friend and we watched the framerate tank. Perhaps if I could share my misery with a friend I would enjoy myself more, but solo play in this game is not for me. I have not played '7 Days to Die' on Steam and I am struggling to understand why people would choose this over some of the really excellent survival games out there. Maybe on PC it’s really great. On the Xbox One it is not.